I use to do what? I use to be a quilter. In fact, I use to teach quilting and I would sell quilts. I would dream of fat quarters, have a stash that rivaled the best fabric shops, and when on vacation I would purchase fabric from other countries. Quilter’s cotton is luscious to my finger tips. This summer there are 5 baby boys who will make an appearance. I love babies until they reach 3 months old. Then I do not have much use for them until they turn 4. I like 4 year olds, they remind me of me. 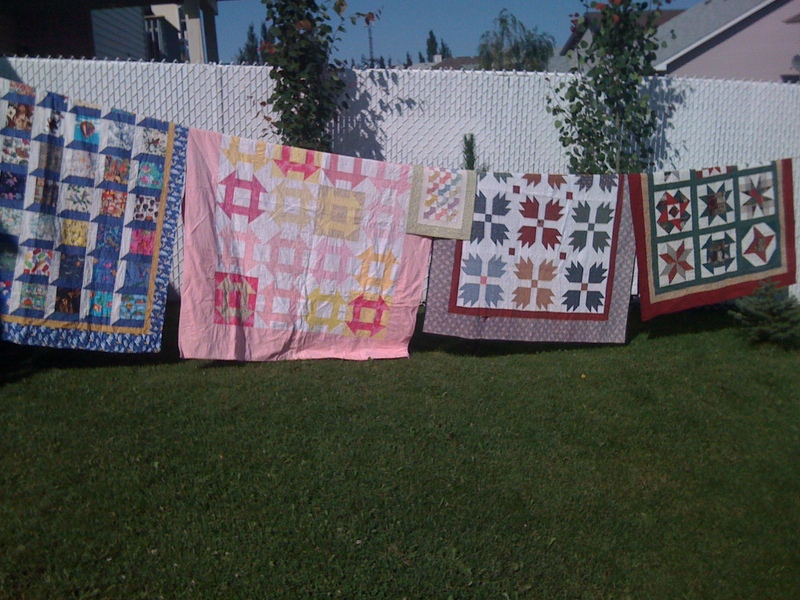 This was the summer I was going to make 5 baby quilts and see if I could become a quilter again. The answer is… no, I am no longer a quilter. I treasure the quilts I have made, but I am pretty sure I will not go all crazy bananas over fabric anymore. I even spent some time in a quilt shop to feel inspiration, but the fabric didn’t appeal to me. It was as if I was stuck in a time warp of old fabric. I can’t get past the stuff I loved and give it up for the new patterns and design. There is a box in my garage of UFO’s. To my space loving son, those are aliens, to my quilty friends, those are UnFinished Objects. I went and unearthed the box. It was covered in an inch of dirt and dust. When I opened it, the first thing I saw was my accreditation for work…cool I wondered where that was. I found blocks from quilt exchanges I could never part with. I also found lovely tops. This makes me want to find a quilter who will sandwich the layers together and so I can bind it. I just don’t have the desire to quilt the layers anymore. Digging through the box, I was surprised to discover fabric. Untouched, uncut fat quarters. Several years ago I gave away my entire stash of fabric to Make-A-Wish foundation. 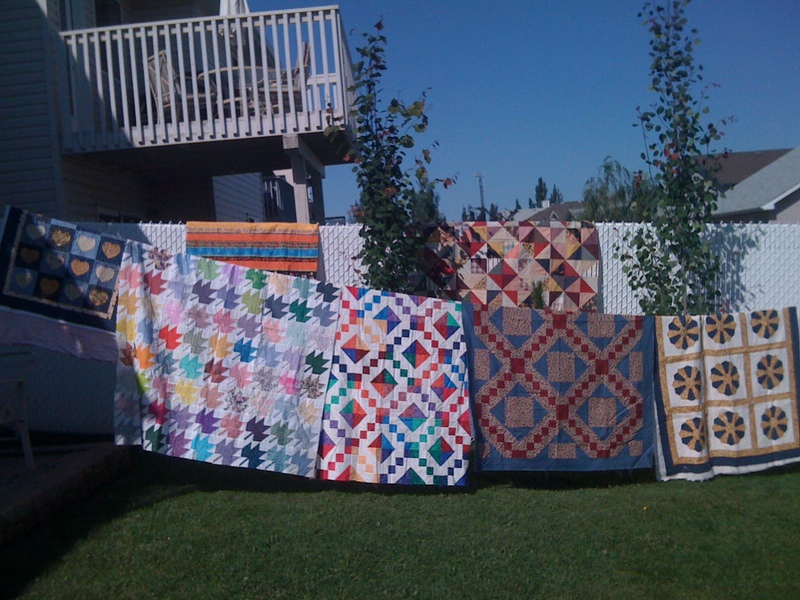 There are a couple of ladies who make quilts for the Northern Alberta Chapter. Their goal is to give ever child who gets a wish, a quilt made by their hands. I gave them blocks and tops and four giant blue bags filled with fabric. I felt good about Wish Kids getting to enjoy quilts with a little bit of me in there. So looking at the fat quarters, I wondered what my plan was. I have enough fabric to make a charming Christmas Quilt, but…. naaaaaaaaa. After digging out all my tops and blocks I realized I kept the ones that meant something to me. The Halloween Strip quilt top, I purchased the fabric on a visit to meet a quilty friend in California. Dresden Plate, This is nearly finished being quilted, Sadly I am not skilled enough – not do I have the tools to finish it. Maple Leaf Top from a quilt exchange. Rows from a Round Robin I participated in. Scrap Half Square Triangles from the first class I ever took and an assortment of other UFOs. The box also contained a Debbie Mum box that held my notions. I was delighted to discover my betweens, tiny precious needles for hand quilting, applique and binding. My thimble collection was also there. I have a Charles and Diana thimble from a trip to England just before the couple was married. That made me laugh. Chatterbox a wants the Halloween Top so she can learn to hand quilt. She can have that one. The rest? I need to find a quilter who will take pity on me and help me finish these. Meanwhile, I have a baby quilt to finish for my beautiful grandnephew. < The sad reality, is I am coffee lazy. I hear ya! There are always a million things to do. But there was a time when it was a priority – but not any more… school took over from that role. I have relatives of your UFO’s….we shared many swaps together. Your Jewel Box top has inspired me to perhaps put my blocks together now that I know how awesome they will look!!! I don’t know Rags….I think once a quilter…always a quilter. There’s always a passion inside that doesn’t let go. A few of my favorite quilts came from your passion and your hands. my favorite quilt is the grean yellow brick road quilt you made me. I think I love the ones that you quilty gals gave me more that the oness I made myself. Being part of the group was the fun part. I need to follow your lead and get these puppies off to a quilter!